June is our first Winter month! It's cool and crisp and a great time to visit. Even the whales agree! With school holidays later in the month it is a popular time for holidays on the Gold Coast. Welcome to Winter on the Gold Coast! June is also the start of the whale watching season in Gold Coast. Whale watching tour boats start heading out to find the whales in early June and runs to the end of October. The best way to see the humpbacks is from a boat - you are more likely to see one and also get a closer view. Sometimes there are excellent viewing opportunities from land in unexpected places! For instance a high rise in Broadbeach gave an excellent viewing platform for whales frolicking between the beach and sandbar! Another good spot is the headland at Point Danger, you can see it in the photo above. Don't forget to pack your binoculars. And, if you are lucky you might even catch a glimpse of our famous Migaloo, a unique white humpback whale. June isn't all about whales and you might notice that the season has ticked over to winter! Don't let that put you off. Late in June there are school holidays, and early in the month a long weekend for the Queen's Birthday, both of which make our accommodation and attractions busy. This is a popular time for visitors from the cooler southern states of Australia and New Zealand, escaping cold winter to enjoy our winter sun! Winter in the Gold Coast is truly AWESOME! Our winters on the Gold Coast are mild by most northern hemisphere standards. I get many questions about the weather in June and during the winter months on the Gold Coast. Mostly, I get asked whether you can still visit the beach and the Gold Coast water parks (Wet n Wild and WhiteWater World). The answer is that the Gold Coast is a year round destination and you can enjoy most of our attractions throughout the winter months. If you are coming from a northern hemisphere summer, you may find we are cooler than your summer, but we are certainly not a cold destination. The water temperature on the Gold Coast is on average 21°C so the beaches and water activities are pretty much an all year attraction! Check out the other questions or read on to find out more about visiting the Gold Coast during June. All the information below is updated each year to keep it current. I recommend, if you haven't already, that you get a copy of my planning cheat sheets. Use the information on this page to fill them in, to help plan your holiday. In the table below are averages for various weather indicators for Gold Coast in June. Click here for current weather information in Gold Coast. Daylight Trend: Shortest Daylight Hours of the year. Warm to hot during the day but the nights get cooler – particularly inland from the coast. The humidity isn‘t so stifling at this time of the year because the temperatures are lower. This is the start of the generally drier part of the year in Gold Coast. Around 6% of the annual total rain falls in June and on average less than 10 days of the month have rainfall. Crisp clear days with blue skies the temperatures can get into the 20s, but you will feel that is "winter" by the late afternoon and evening temperatures when the sun drops out of sight. I feel the cold, so I say pack some warmer clothes and a jumper or jacket for the evenings or visits to rainforest. Often at this time of the year, I wear shorts and t-shirts during the day and in the late afternoon slip on a fleece or put longer pants on. * Queens Birthday Holiday moved from June to October from 2016 onwards. What's On In The Gold Coast In June? Cooly Rocks On festival in Coolangatta (replaced Wintersun Festival) usually runs around the end of May through to early June. More events and dates for June events on Gold Coast. A great time to escape from the cooler weather in the southern states! Early in the month without kids, later in the month to co-incide with school holidays. Be careful this is when most people decide a move to the Gold Coast is the thing to do! If you like swimming highly recommend accommodation with a heated swimming pool – it‘s easy to get caught out on this one! Pack clothing for warm weather during the days and cool weather in the late afternoons and evenings. Pack light layers which are easy to carry and put on when it turns a bit cooler in the afternoon. If you are heading inland, that is generally cooler than the coastal areas at this time of year and when the sun drops behind the mountain ranges it can get quite cold quite quickly up there. I pack my trusty rain mac as an extra layer of warmth and wind protection though you are less likely to need it for rain at this time of year, it cannot hurt to pack it! Any winter month in the Gold Coast is awesome – June is no exception. Days are generally warm with clear blue skies and nights are just a little crisp. Highly recommend accommodation with a heated pool if you like to swim after a day‘s sightseeing - this will definitely make it more enjoyable. If you have the luxury of picking your time, you will save money and avoid the crowds by coming in early June before the School Holidays start. Most of our visitors (except you New Zealanders, but you know what you are in for here - warmth compared to NZ!) are coming from Summer weather to our Winter weather. Unless you are coming from a really hot country you are not likely to find the weather cold. Gold Coast Winters are mild. It does cause some confusion our topsy turvy seasons! Pack light clothing for warm weather (shorts and t-shirts) during the day and warmer clothes with longer sleeves or pants for the evenings or if you plan to head out on a boat to whale watch or to our hinterland rainforest where it will be a bit cooler. Warm clothes for visits to Gold Coast rainforest areas in hinterland - such as Mt Tamborine, O'Reillys, Lamington Plateau or Springbrook National Park. A day of rides and shows at MovieWorld. It may be officially winter in the Gold Coast but 21C average sea temperature it is still warm enough to swim in the ocean, but always between the flags. Wet n Wild has heated water at this time of year - go on I dare you the water is warm! Why not try your hand at Snorkelling & Diving in Gold Coast? Go game fishing on a fishing charter. Game of golf at a resort course or one of the other 30 plus venues around the area. Whale watching season highlight this month is spotting migrating whales from the beach or headlands. Australian Outback Spectacular Dinner Show for an Aussie experience of a lifetime. 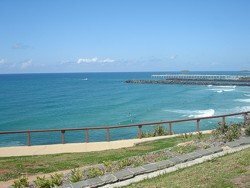 Your Questions About Gold Coast in June? Do You Have A Question About June In The Gold Coast.? Ask a specific question about June in the Gold Coast, Queensland or Australia is and I will try my best to point you in the right direction. Is Early June the Best Time to Visit Gold Coast?